Mr Papafakis: 1st squad, a bit of 2nd & two characters....on the slab. 1st squad, a bit of 2nd & two characters....on the slab. In the above pic (collage to the rescue) you might be able to see that I've drilled out the barrels on all of the weapons, it's a piece of cake on placky mini's so it was no trouble to do them all in the one go. You may have also noticed that there's a few of them with one of their legs not touching the base....I'll be giving them something to stand on or leave them in the "mid step" position. These guys aren't finished yet either. They still need the modified section filled in & smoothed out, but I think I'll do that work once the lot of them has been completely assembled. Great work, Im really inspired by your conversions. 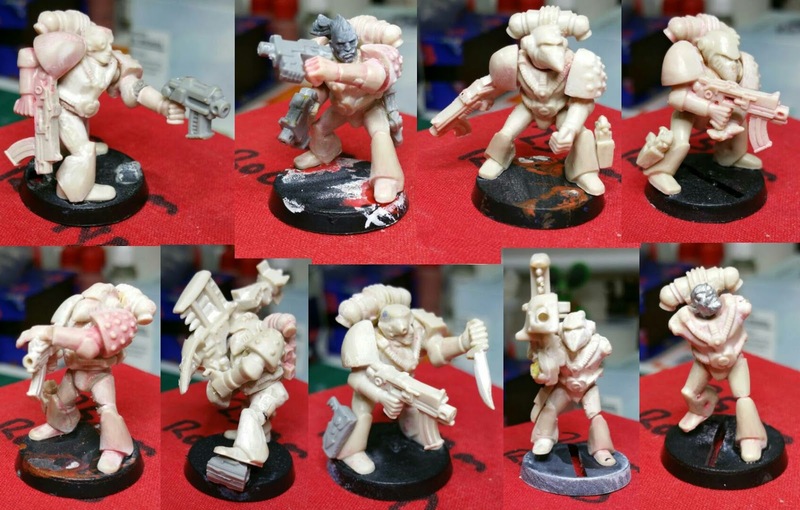 Im doing a low-key project with some of these old marines too at the moment and its really useful to see your poses. If you want it please let me know! Thanks for the compliments Curtis. I really like pimping up these marines...it's about as close to sculpting as I can get :) I'd be interested in seeing your incarnations too. Any chance they'll be making an appearance? Regarding the offer, thank you very much, but I've actually decided to make my own from scratch. A crazy idea I know, but I'm not much of a fan of the RT jet bikes. Once I've finished making up the marines I'll start on the bikes.